1. At the CA server, log in as Domain Administrator. 2. Click "Start > Administrative Tools > Certification Authority". 3. 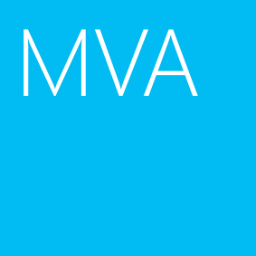 Expand "<CA Name> > Issued Certificates". 4. At right pane, select all certificates. 5. 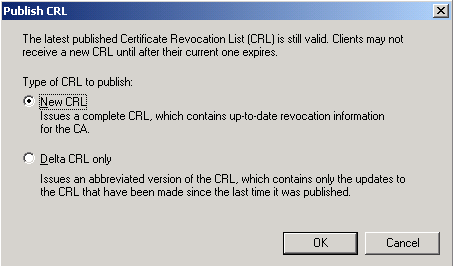 Right-click the selected certificates, select "All Tasks > Revoke Certificate". 6. Next to "Reason code", select "Cease of Operation". ﻿1. In the "Certification Authority" console, select "Certificate Templates". 2. At right pane, select all certificate templates. 3. Right-click the selected certificate templates, select "Delete". It can prevent users to request the certificate from the CA Server. 1. 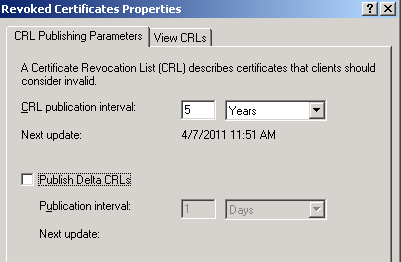 In the "Certification Authority" console, right-click "Revoked Certificates", select "Properties". 2. Next to "CRL publication interval", type a suitably long value. 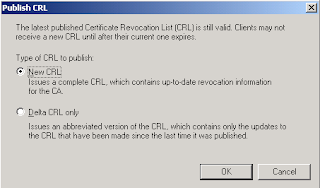 Remark: The lifetime of the Certification Revocation List (CRL) should be longer than the lifetime that remains for certificates that have been revoked. 3. Clear "Publish Delta CRLs" check box. 1. Still in "Certification Authority" console, right-click "Revoked Certificates", select "All Tasks > Publish". ﻿2. Select "New CRL", click "OK". Remark: Make sure all clients can access the CDP of CRL. 1. Still in "Certificate authority" console, select "Pending requests" folder. 2. At right pane, select all pending requests. 3. Right-click the selected pending requests, select "All Tasks > Deny Request". 1. Launch "Command Prompt", enter "certutil -shutdown". 2. 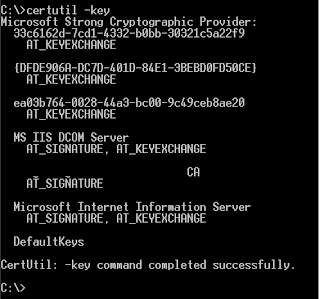 Enter "certutil -key"﻿ to list all the key stores for local computer. 3. Enter "certutil -delkey <CA Name>" to delete the private keys associated with the CA. certutil -delkey "Windows 2003 Enterprise Root CA"
4. Make sure the private key for your CA has been deleted. 5. Use "Add\Remove Windows Components" to uninstall "Certificate Services". When the CA is uninstalled, only the pKIEnrollmentService object is removed. The other objects are left in place because there are likely still outstanding certificates issued by the CA. In order for clients to successfully process these outstanding certificates, they need to locate the AIA and CDP paths in Active Directory. Good practice is to revoke all outstanding certificates (Reason: Cease of Operation), extend the lifetime of the CRL, and publish it in Active Directory. When those outstanding certificates are processed by the various clients, validation should fail and those certificates will not be used. 2. Launch "Active Directory Sites and Services". 3. 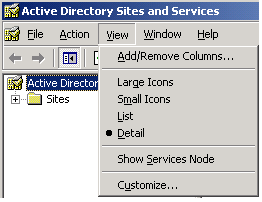 At left pane, select "Active Directory Sites and Services". 4. On the menu, click "View > Show Services Node". 5. 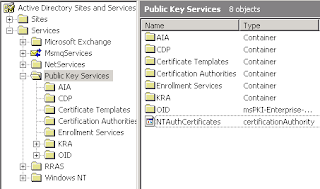 At left pane, expand "Services > Public Key Services > AIA". ﻿6. 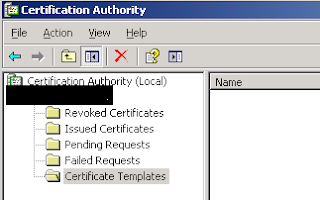 At right pane, delete "certificateAuthority" object for your Certification Authority. 7. At left pane, select "CDP". 8. Locate the Container object for the server where Certification Services is installed. Delete the container and the objects it contains. 9. Select "Certification Authorities"﻿, delete "certificateAuthority" object for your Certification Authority in right pane. 10. Select "Enrollment Services", verify that the pKIEnrollmentService object for your Certification Authority was removed when Certificate Services was installed. If not, delete it. 11. 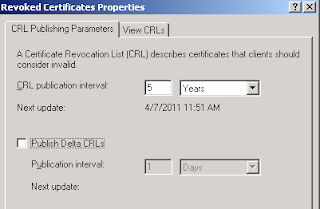 Select "Certificate Template", delete all the Certificate Templates in right pane. 12. 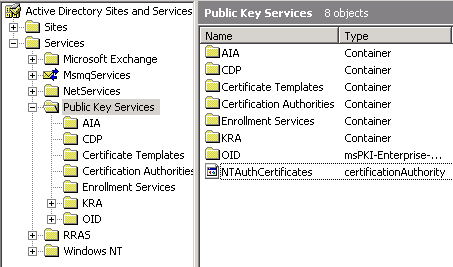 Select "Public Key Services", locate the "NTAuthCertificates" object. 13. if there are no other Enterprise or Stand-alone CAs installed in the forest, delete the object. 1. To remove the CA database, delete the "%systemroot%\system32\Certlog" folder. 2. Launch "Command Prompt", enter "certutil -dcinfo deleteBad". 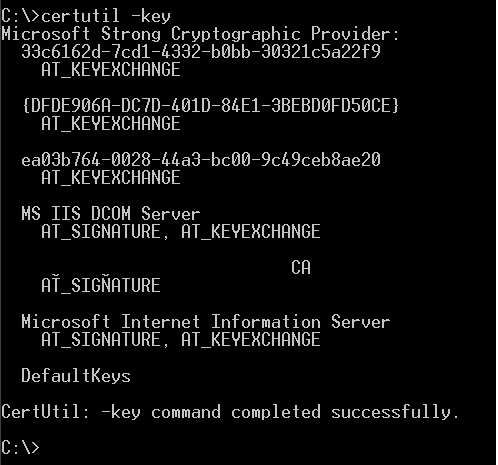 Remark: Certutil.exe tried to validate all the DC certificates that are issued to the domain controllers. Certificates that do not validate are removed. You say - "Make sure all clients are received the latest CRL". How do I make sure of this?? What if some machines no longer exist or people are away on vacation? Sorry for my mistake. The remark shoule be "Make sure all clients can access the CDP of CRL". The latest CRL was changed the interval to 5 years. If the machine is no longer exist, there is no problem. If people are away on vacation, I think people don't take vacation more than 5 years.